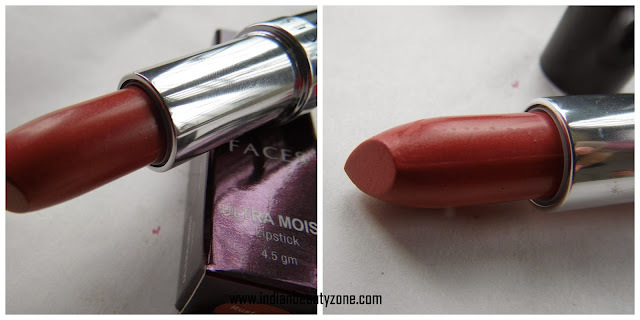 Faces Canada Ultra Moist Lipstick comes in a thin black small cardboard box. The lipstick case is comes in a cylindrical black one, which is similar to their faces cochic lipsticks range package. 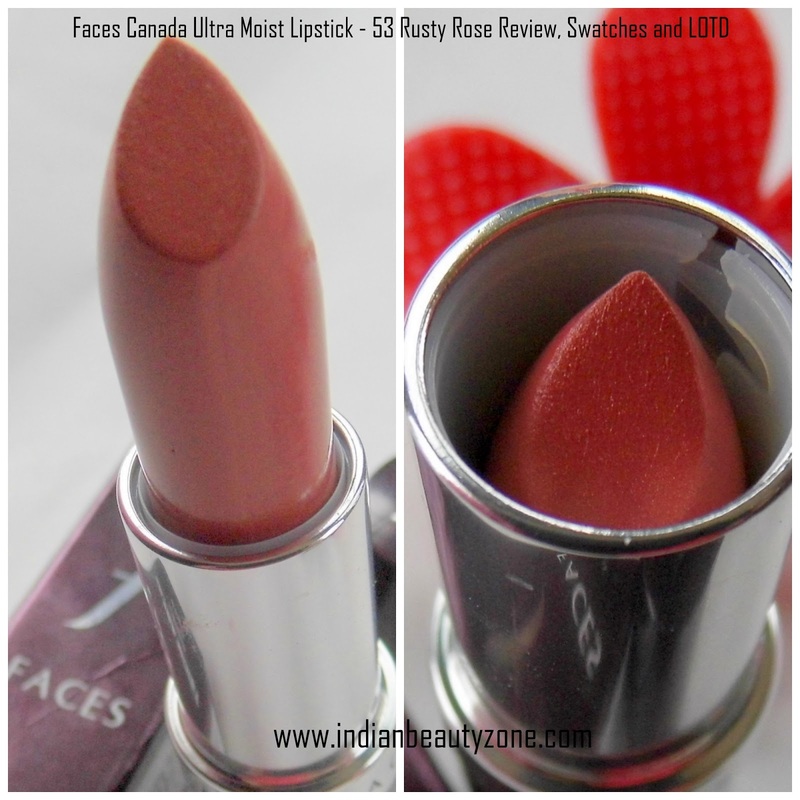 The texture is creamy and thick and the smell is ditto faces cochic lipstick's weird smell. But the smell goes off after few minutes. The shade name is "Rusty Rose" , when I swatch it on my hand the lipstick shows a tint of pink with rusty red. But when I applied it on my lips, it looks completely different like coral mixed with rose shade. I can see the coral colour is dominant here, so it is a shade of coral with pink tint lipstick . The pigmentation is super awesome. The lipstick stays on the lips for 4 to 5 hours with taking small snacks and drinking water(slight lip services). But with heavy meals you need to reapply after 2 to 3 hours. I never seen any lipstick stays on the lips after a heavy meal. We ended up eating the lipstick too... is it? I would say this lipstick stays for pretty good time and leaves a beautiful coral tint after fading off. I am in complete love with this lipstick and especially with this coral rose shade. The lipstick shade in the bullet looks dark dusty rose exactly what they mentioned in the shade name. But, when I swatch it on the hand it looks lighter than shade we are seeing in the bullet and completely transfers to coral rose shade when I apply on my lips. 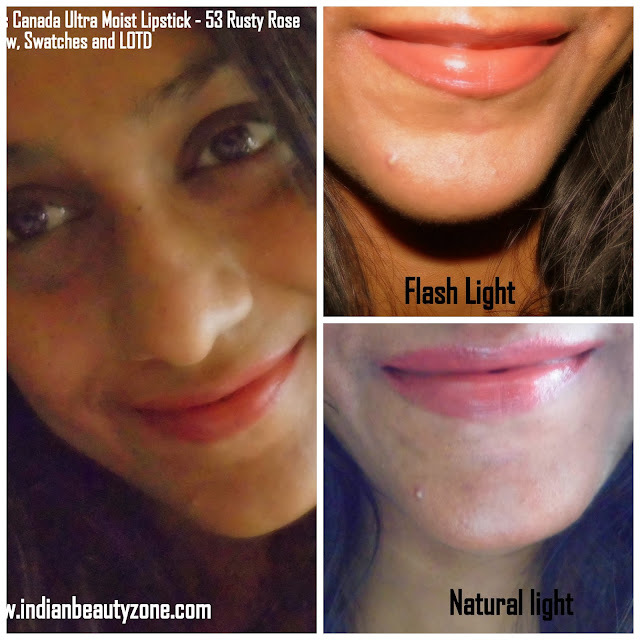 This Faces Canada Ultra Moist Lipstick - 53 Rusty Rose lipstick covers my pigmented lipstick very well and it's creamy texture moisturize the lips very well (ofcourse it is ultra moist). Completely worth for the price when we compare with it's quality, this shade can brighten up any dull face and believe me I didn't wear any makeup in this FOTDs. Will suits for most of the skin tones in India. Stays for 4 to 5 hours with light lip service. Creamy texture gilds on the lips easily. Ultra moist as they claim. Goodness of Shea butter, Almond and jojoba oil. It has subtle golden shimmers (I think) but it is not shown much on the lips and gives beautiful glossy look. This shade may washout dusky skin. Faces Canada Ultra Moist Lipstick - 53 Rusty Rose is a must have shade for medium, light skin tone girls, would not suitable for very dark skin girls. They have awesome 18 shade collections to choose. Get one for you girls, I am sure you will love it. This shades can be dupe for MAC shades. such a gorgeous shade. this can be used everyday. Indeed a wearable shade. I got the shade in pretty pink! Beautiful shade and you look pretty with it. I have this color too. I love it. Its really suits on your face but the little pimple on your chin is quite noticeable. Sorry if you mind but its true. A little confused how the shade really looks. Looks so different in different lighting.